Since writing is such a huge part of the Common Core Standards, I've decided to start doing a blog post on the last Wednesday of the month, called Writing Wednesday. On the last Wednesday of the month throughout the summer, I plan to share some strategies I use with my middle school students and would love to hear what you do w/ in your classes, as well! 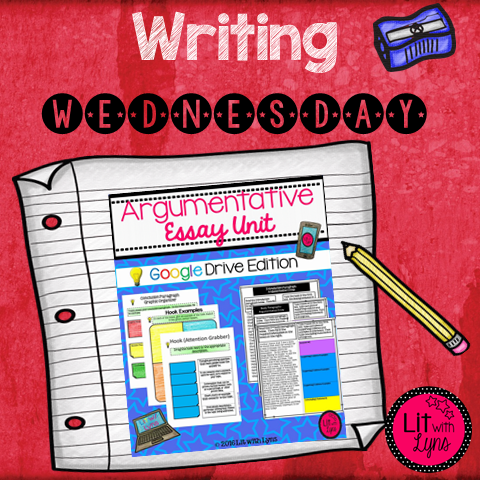 This month, I'm going to highlight my Argumentative Writing Unit- Google Drive. 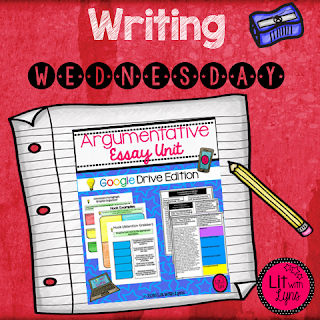 This unit demonstrates each step that should be included in an argumentative essay. It walks students through the various elements of each paragraph, then requires students to identify the elements themselves (hook, background sentence(s), thesis statement, supporting evidence, concluding statement, etc.) . Once students have developed a clear understanding of all that the essay should include, then the unit delves into perfecting each of these areas; they will work on writing strong hooks (attention grabbers) developing strong topic sentences and supporting details, as well as conclusion paragraphs. The best part-- it's paperless (although it's printable if necessary), and it's interactive, which allows students to work w/ the movable pieces that are included in the Google file. 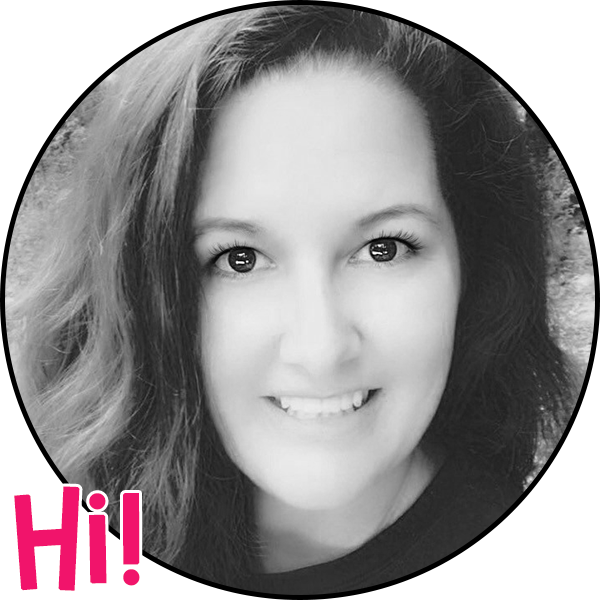 Please feel free to link up and share your strategies or products that you use to teach writing. Don't miss our next linky for more writing strategies--the last Wednesday of July-- July 27th. Thanks for hosting this great link-up! I love your digital version unit! It's so colorful and interactive! Thanks so much, Lisa, and thank you for participating! Thank you! Thanks for joining us for this!